Chronic obstructive pulmonary disease (COPD) is an umbrella term for progressive, obstructive lung diseases, including emphysema and chronic bronchitis, that are characterized by chronically poor airflow. Cigarette smoking is the most common cause of COPD, but heredity and exposure to air pollution and particulates are also factors. COPD symptoms include shortness of breath and a chronic, productive cough, as well as fatigue and wheezing. Often, patients suffering from COPD complain of headaches and difficulty exhaling, as well as frequent colds or flu. Treatments may include inhaled bronchodilators, steroids and oxygen therapy. 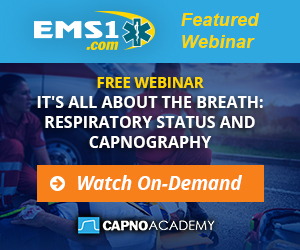 Quantitative waveform capnography can serve as an accurate, noninvasive parameter to help EMS providers recognize bronchospasm in initial assessments and to gauge the effectiveness of therapy. Diminished breath sounds, wheezes and crackles can be caused by multiple conditions, including asthma, COPD and pneumonia. Accurate diagnosis of the cause of respiratory distress is critical, but it can be difficult when the patient has difficulty speaking or suffers from multiple chronic respiratory conditions. When added to a thorough history and physical exam, waveform capnography is a valuable assessment tool to determine the severity of a COPD patient’s respiratory distress, to guide treatment decisions in the prehospital environment and to monitor the patient’s response to those treatments. Patients with COPD often call EMS during periods of exacerbation, during which the symptoms worsen rapidly. More than half of all exacerbations are the result of respiratory infections, and one in every three patients with an acute exacerbation of COPD will die within a year of first contact with the EMS system. A thorough assessment is critical to patient survival. The NIH says that COPD is a major cause of disability and the third leading cause of death in the United States. This site provides a basic overview of the disease and how it affects lung function, as well as illustrations, instructive videos and links and a quiz. Download a Spanish info sheet here. The American Lung Association provides a page for health professionals with resources for patient-centered COPD care, community-based education and advocacy programs, clinical trials, tobacco cessation and more.